It’s no secret that the music industry is over-saturated, so much so that it seems like even major bands’ releases can get lost in the shuffle. Now more than ever, it’s imperative to have creative marketing tactics – and Minnesota-based singer/songwriter Jeremy Messersmith just had one of the most creative album announcements of the year so far! Of course, the goal with any marketing plan is to get your product stuck in the consumer’s head, and the truly memorable campaigns are interactive to some degree. Instead of simply announcing that he would be dropping a record, Messersmith announced that he had released a free songbook of a forthcoming record. Blasting it out first to email subscribers, then second on various social media networks, 11 Obscenely Optimistic Songs For Ukulele: A Micro Folk Record For The 21st Century and Beyond [April 2017 via Glassnote Records] was born. But clearly, not as your typical album-release. Messersmith let all of his secrets interlaced in the record out before the record was available, through a downloadable PDF version, including a breakdown of the music and lyrics. Since Messersmith only plays ukulele on the record, listeners could (and were encouraged to) make videos of themselves performing the songs that the record consisted of. In some cases, that could have taken the thrill of listening through the first time away, but for Obscenely Optimistic, it worked out in its favor. Messersmith, who hasn’t released a new album since 2014, successfully reminded us that he isn’t sequestered away, and that the wait will be worth it. 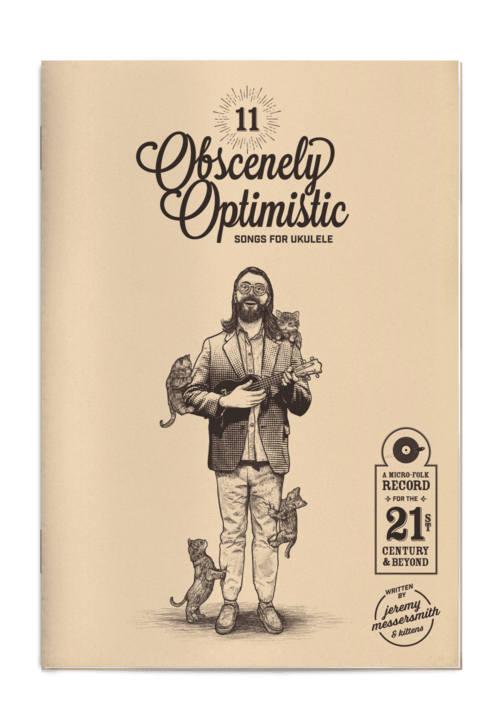 His message for Obscenely Optimistic is that it’s important to be positive in our day-to-day lives, especially in the current political climate. To promote the short project, Messersmith is embarking on what he’s calling a “Micro-tour” dubbed “The Greatest Road Trip Ever!” It is essentially a collection of 50 free shows, consisting of un-amplified music in a scenic and notable public place. He is encouraging attendees to bring an instrument and to sing along. And they’ll be singing along to the entirety of Obscenely Optimistic: the self-accompanied by ukulele record we’re here to talk about. The album kicks off with “Everybody Gets a Kitten,” which is one of the longer songs on the short album. Clocking in at two minutes, the opener is a little ditty about looking into the future and being excited about it. The highlight of the track is obviously found in the title: Kittens! You can name if you want, or not. Even if you’re not a fan of cats, the idea of owning a small animal can usually bring a little bit of warm and fuzziness to your heart – and kicking the album off with this notion is the only appropriate way to introduce it. The second song on the short album is another highlight: “There Is Nowhere We Won’t Go.” Giving off the vibes of a campfire song right off the bat with Messersmith being accompanied by only a percussive beat from his hand and the ukulele, the chorus serves as a short explanation behind the record. There is nowhere we won’t go. By the time the chorus kicks in, the ukulele is back in, cheerfully strumming along with simple chords. But the cheese-taker for this micro-folk record is easily the first and only single that was released, “Everything is Magical.” Performed at South By Southwest and previewed at his earlier live shows; it’s about how it doesn’t matter where you are, what you have, or what you’re doing when you’re with your special person. What’s nice about this song is that it doesn’t have a romantic undertone to it if you don’t want it to, which makes it even more accessible to audiences. It’s a simple enough song to pick up on the ukulele, but varies enough musically to keep it interesting and on repeat for days on end. Some lyrical highlights? Verse three: “I believe in unicorns, and wishing on a star/I believe that love can heal, broken hearts/So cover me with pixie dust, I’m jumping off the roof/’Cause everything is magical, whenever I’m with you.” Coincidentally, this is also the longest song you’ll find on the record, clocking in at 2:18. Even though the title is a bit deceiving, 11 Obscenely Optimistic Songs For Ukulele: A Micro Folk Record For the 21st Century and Beyond only holds 10 tracks, but it lives up to the optimistic and micro expectation. The record serves as both a reminder that Messersmith isn’t sitting on the sidelines, and that he has more to offer than conceptual albums about death (The Reluctant Graveyard, [2010 via Princess Records] or full of medical jargon (Heart Murmurs, [2014 via Glassnote Records]. And rumor has it: there’s still more new music to look forward to from Messersmith in 2017. But more traditional, and hopefully, at least a little bit longer.